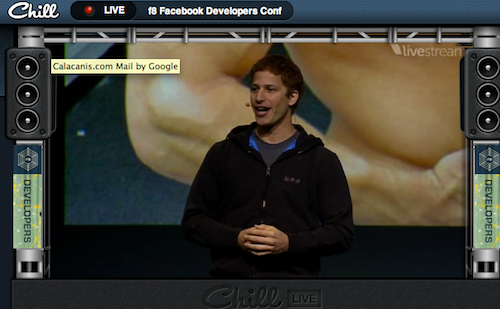 Comedian Andy Samberg kicked off F8 by impersonating Facebook CEO Mark Zuckerberg. Samberg joked about adding a new section for "I'm not really friends with these people." (We wish). Still, Facebook is expected to launch major updates today at F8 in San Francisco. The first update is the Timeline. Mark Zuckerberg reveals Timeline at f8. Check out Facebook's Timeline preview video and demo Timeline here. Timeline will also work on mobile devices like the iPhone. "Like" in FB terms is used as both a noun and verb, now it's got verbs like "reviewed" and "watched." Listen to Spotify with friends live on Facebook, and see your friends' music Timeline and the albums they listen to most. In this instance Mark's friend's top album is Kenny G. You will also receive discovery notifications when your friends find new music because of you. Reed Hastings talks about the open graph and how the seeing a friend watch the show "Breaking Bad" -- which Netflix has been recommending he watch for a while -- got him to try it out because seeing your friend do something trumps the algorithm. Zuckerberg talks about "lifestyle" apps that can provide monthly reports on your activities, like a report from Nike's app can show your friends your running habits or with Food Spotting you can see a breakdown of your eating habits. Here is the Facebook video about a new class of social apps. Facebook CTO Bret Taylor talks about making app discovery a part of the Facebook experience and demonstrates IHeartRadio's social-by-design app that lets you put music on your Timeline. The app that's most social will be the most successful. Developers just need to put an "Add to Timeline" button on their apps and design how that will be viewed on the Timeline. Open graph will work on nearly every device, from those you have in your pocket to tablets and the web. "The more engaging your app is the more people will discover it on Facebook," Taylor says to the f8 audience. Chris Cox, Facebook VP of product, says people love infographics. Shown here: the visual history of Wikipedia. Cox talks about how this idea was the inspiration behind the Facebook Timeline, when the question was asked: What would a one year report for a person look like? Timeline beta launches now as well as apps for music, movies and TV.